Italian artist Francesca Colussi Cramer started embroidering patterns and grids onto found photographs four years ago when she discovered a small vintage shop down the street from her house in North Wales. 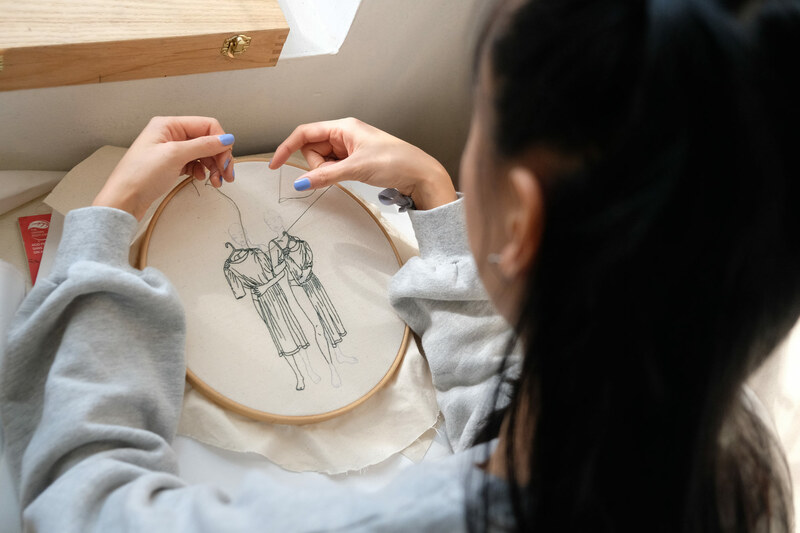 She was enthralled with the nostalgic feel of the store’s old images and postcards, and began adding thread to provide a visual and physical contrast to the original work. Some of her additions are abstract, like images which appear like patchwork quilts, while for others she makes more representational choices by layering the real life hues of a location or person in small bursts of color. 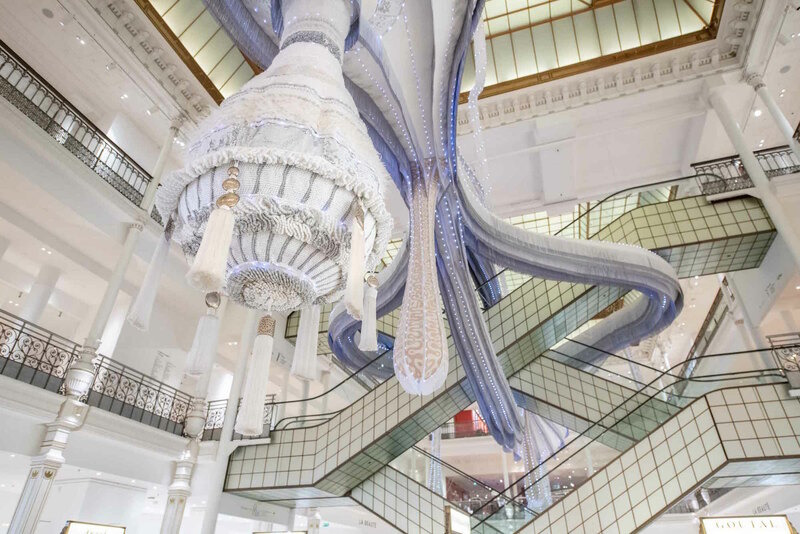 Portuguese artist Joana Vasconcelos (previously) recently installed a large site-specific inflatable installation covered with crocheted fabric and embellishments inside of Paris’ oldest department store, Le Bon Marché. The suspended two-part work, titled “Simone,” is the latest in the artist’s Valkyries series, and takes inspiration from the female figures in Norse mythology. Named for French human rights activists Simone du Beauvoir and Simone Weil, the large piece features two orb-like structures that loom over visitors along the store’s perimeter, and is connected by tentacles that weave around the building’s iconic escalators. The inflatable is dressed in fabric with handmade crocheted details that dangle from its limbs to give it the appearance of an alien chandelier. Color-changing LEDs are also embedded throughout the work and pulse rhythmically, which gives the strange being the entrancing power of a bioluminescent deep sea organism. Vasconcelos tells Colossal that like the winged-horse riders, the works in her Valkyries series “are both warrior and protective creatures, in the way they attack and contaminate yet adapt and engage with the spaces they inhabit.” To see more of the artist’s work, follow her on Instagram and Facebook. Iranian artist Maryam Ashkanian (previously) embroiders portraits of peaceful sleepers deeply resting as a part of her ongoing Sleep series. Each individual she creates begins with a gestural line drawing that is then embroidered onto a handmade pillow. Little hints of the sleeper’s personality are presented by the way the pillow is designed—from a flowered watch on one’s wrist, to a ruffle that encircles that pillow’s outer edge. You can see more of Ashkanian’s textile work on her website and Instagram. Japanese embroidery artist ipnot (previously) continues to dazzle us with her creative miniatures formed from thread and embroidery hoops. The works often incorporate props, such as ketchup bottles or chopsticks, to add an interactive layer to the pieces. Textile noodles are staged in slurping position while a perfect pile of ketchup appears to have just been dolloped onto another one of her works. The artist’s realistic designs typically involve food, like her recent sushi stop-motion animation, or a hovering pizza slice that appears to be connected to an embroidery hoop with melted cheese. 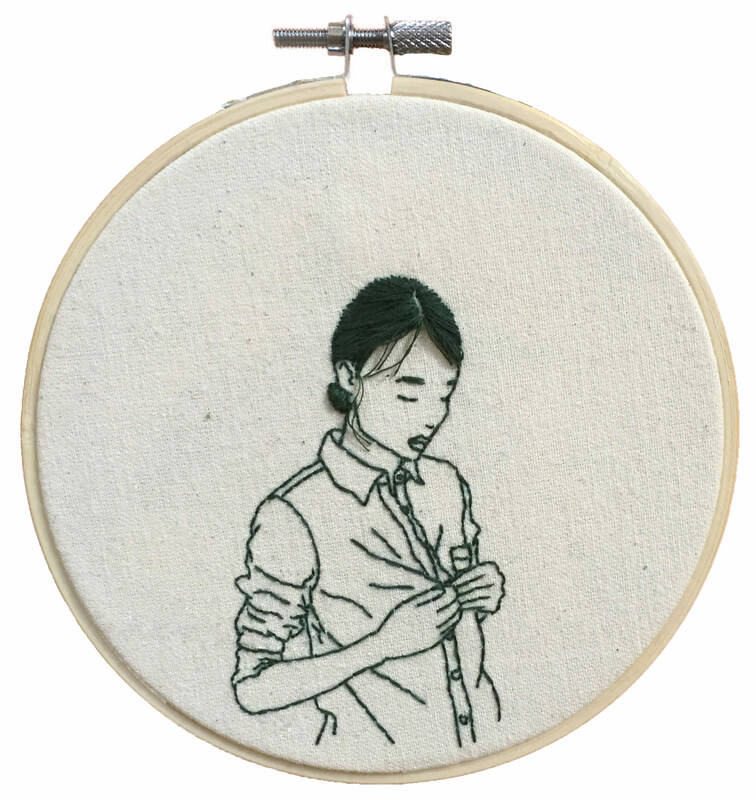 You can see more of the artist’s embroideries on Instagram. Utah-based artist Stephanie K. Clark (previously) considers herself a painter, but the works she creates are not made with a traditional painterly medium. Using embroidery techniques and strands of floss in a spectrum of colors, Clark paints little houses, landscapes, and other scenes that look as if they exist in the natural world and are being lit by the moon or sun. 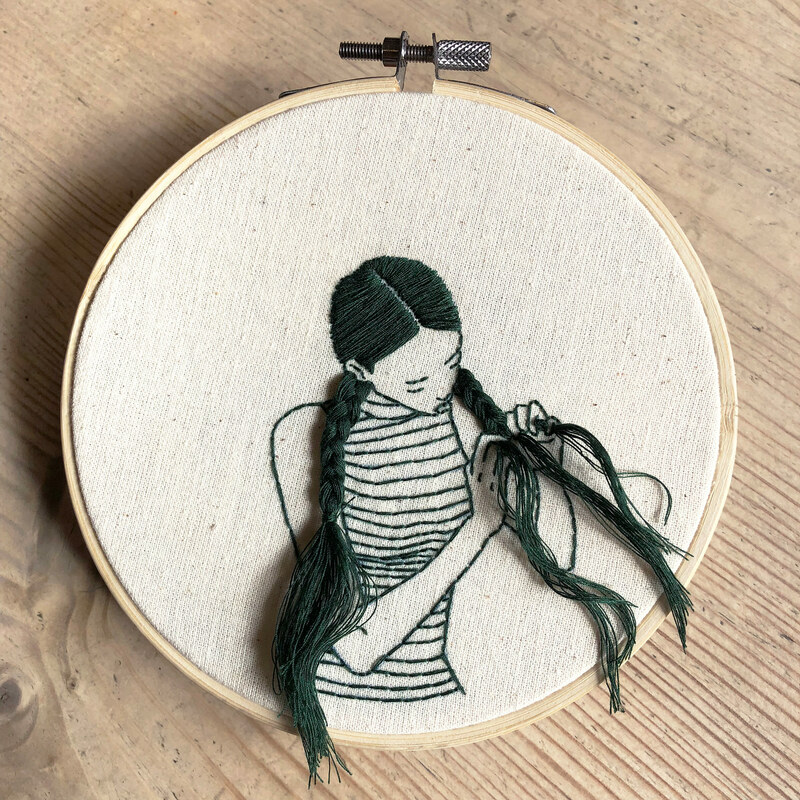 When not working on commissions, Clark’s thread paintings are inspired by her personal life: “My concepts typically go along with my life, my family, my home, and my heart.” To see more of her work, follow her on Instagram. Long locks flow off the canvas from sewn ponytails and braids, which give the monochromatic work a sense of movement from their static position on the wall. Liam’s first solo exhibition in France, Times New Romance, opens at Item Gallery in Paris on October 19, 2018 and runs through October 27, 2018. You can see more of her works on Instagram.